Richard (Homepage) wrote: Another great shot, a simple image that works very well. Fantastic blended background. Omar (Homepage) wrote: oh wow, your winter inspirations. Claude (Homepage) wrote: Superb composition in shades of grey! Very artistic! Arnd (Homepage) wrote: Fascinating idea and perfect execution! Great sense of movement in this shot! Andrés (Homepage) wrote: Very beautiful in its simplicity. beanow (Homepage) wrote: Great idea. Very creative work! BoB (Homepage) wrote: Una composizione davvero brillante. Tom (Homepage) wrote: It took me some time to recognize what it is. It's brillant, I like it a lot. Marcie (Homepage) wrote: Extraordinary..and oh-so-very-creative!!! Celine (Homepage) wrote: Great idea ! Very well done ! 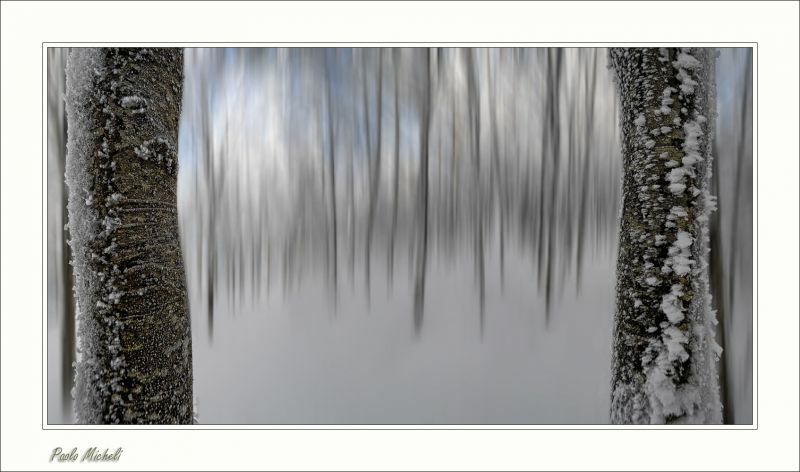 Frida (Homepage) wrote: What a beautiful framing in this beautiful abstract. Francesco (Homepage) wrote: anche per me oggi passeggiata in mezzo ai boschi innevati... e foto simili a questa! Molto bella l'inquadratura e ottimo l'uso della tecnica! Simone (Homepage) wrote: Composta davvero bene, le quinte funzionano alla grande! Yvonne (Homepage) wrote: Love the DOV and composition used in this image.. great framing!